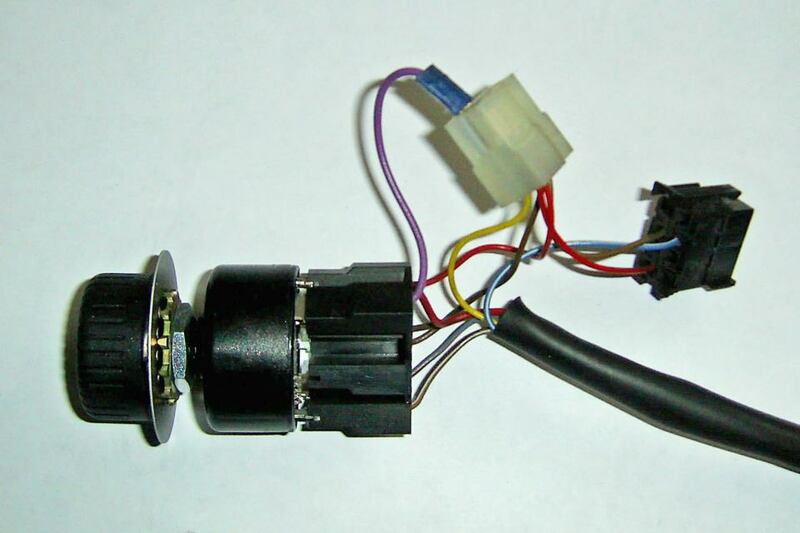 The controller is the part you use to switch on / off, not the ECU inside the heater. Eberspacher Rheostat controller plugged into its connector. 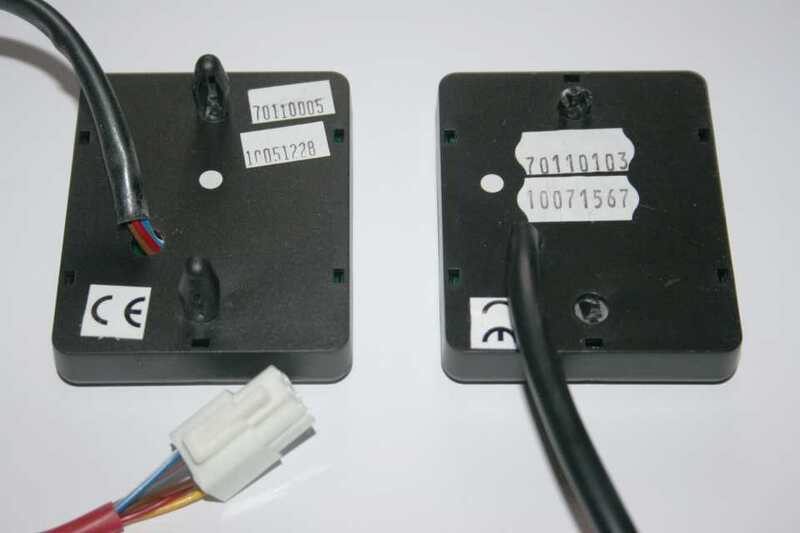 If the connector is not available connection to the rheostat can be made with spade terminals. Some rheostats have an extra anticlockwise switch position, this was possibly intended as a ventilation setting on D#LC heaters. It will not work with Airtronic or D#LCC heaters. There are a few rheostats that have the anticlockwise switch mechanically but no electrical contact is made, very odd! Typical Ebay price £45 to £55 April 2015. This controller would be my personal choice for a heater if we did not already have diagnostic facilities. Switching, temperature control and diagnostic facilities will work ok with D#LC and D#LCC heaters but the ventilation button will not work because of technical differences from the Airtronic heaters. **See below. This controller is described as water heater compatible and is 12 / 24v. The Eberspacher 801 has two built in temperature sensors (bottom left). One is used to display the ambient temperature. 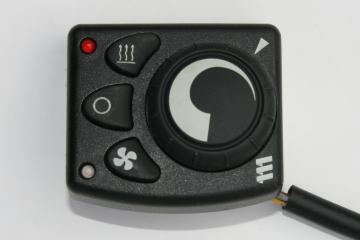 The second sensor provides an optional remote temperature sensor which can be connected if required. If the controller location is not ideal, like on a cold outside wall or in a draft, a separate optional remote sensor may still be needed. 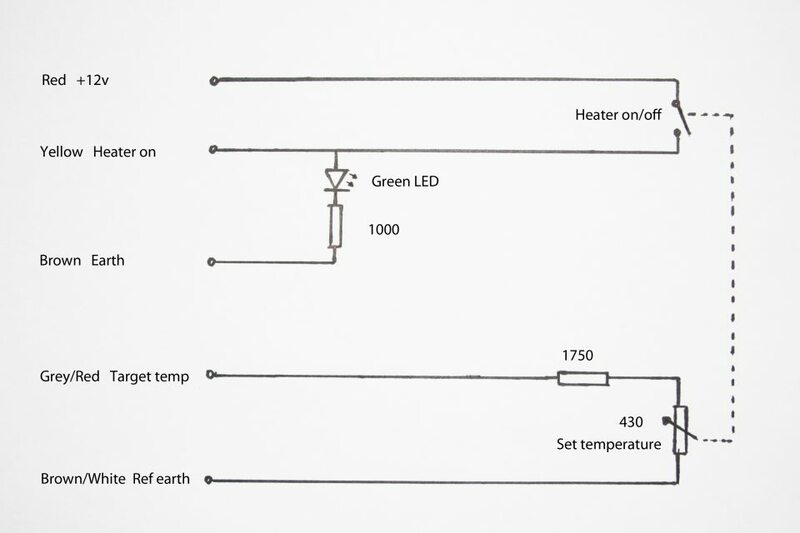 See the remote sensor page for more information on remote temperature sensors and the wiring details. For full 801 details see the manual but here is a brief summary of the facilities. Switch on manually: Press the heater button. Green LED illuminated. Display shows ambient temperature at the 801, it never displays the heater internal sensor temperature. Use the ^ and v buttons to set the temperature, adjustment range 5 to 32 °C. Display shows target temperature during adjustment, then reverts to ambient temperature. Switch off manually: Press the heater button. Ventilation mode: Press the fan button until blue LED illuminates. (Will not work on D#LC or D#LCC **See below). Switch off manually: Press the fan button. Diagnostics: Press and hold the heater button until "dA" displayed. The blue LED will briefly illuminate and flicker as data is transferred. (Uses the blue/white wire so this must be wired in). Display shows F0 followed by fault code then scrolls through previously stored fault codes up to a maximum of 5. An updated / corrected list of fault codes is on our Fault codes page. We recommend you make a permanent record of these codes before wiping them as the information can be valuable for diagnosis. Some faults including codes 15, 17, 50 lock the heater both for your safety and to protect the ECU. Always identify and remove the fault cause before unlocking. Clear stored faults / unlock by pressing ^ and v buttons together. If a fault persists the heater is still faulty. Press Heater button to exit diagnostics. **Using the 801 701 and Mini controller with D1LCC D3LCC D1LC D3LC D5LC. D1LCC D3LCC D1LC D3LC D5LC ventilation modes are not compatible. Jim Warne connected an 801 to his D1LCC and found that after pressing the ventilation button the fan started for about 3 minutes before it stopped and then the heater started again. It also occurs with the 801, 701 and mini controllers. Users confirmation would be appreciated. The 701 00 006 model has a 1 hour maximum on time but it can be bypassed with a simple manual switch. Thanks to Paul who was selling a 701 on Ebay for telling me how in his listing, we did not have one to try. "This timer is from a BT van,which means it has seven day program, heat adjustment, no diagnostics but has been set to run for one hour only before cutting out, the way I got round this is to add a switch between the red and yellow wires, so before the hour is up hit the switch and it runs on, light on thermostat goes out, but it still allows setting temperature in normal manner"
"When the device is installed in the normal way, you then add a 12v switch between the red and yellow wires, and even when control back light goes off, you can still control the heat setting and timer just the same, back light comes back on when you adjust setting briefly, got to the point when I only switched it on via the 12v switch, worked fine." 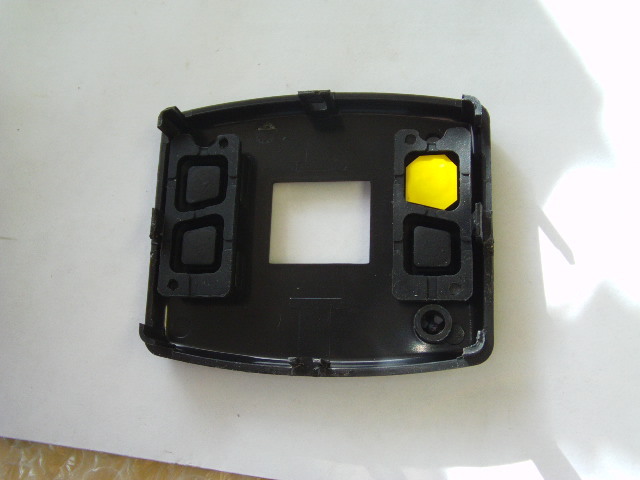 The case has a retaining latch in the centre of each side. 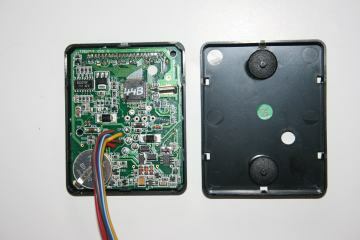 Front and rear views of the 801 circuit board. Photos Jim Warne. Initial setup option for latest version. The latest version of the 801 series Digital Controller (serial numbered above 5000) can be pre-programmed with three (or four) modes of heating / ventilation duration with either °C or °F readout. 1) Continuous heater run until the heater is switched off manually. 2) 1 hour maximum run duration if heater is not switched off manually, after which time the heater switches off automatically. 3) 10 hour maximum run duration if heater is not switched off manually, after which time the heater switches off automatically. Disconnect the 801 from power. Press and hold down the "UP” and “DOWN” keys. Re-apply power to the unit. The display will read n0, n1, n2, n3, n4 or n5, release both keys. To store the new setting press the “Heat” key and the display will return to ambient temperature. *Brown and grey before July 2013. Wiring details are colour for colour on the later 701s. An air heater controller's function is to switch the heater on and set the required temperature. A water heater controller's function is to switch the heater on. A separate thermostat may control optional fan matrix heating. Some controllers do not have a temperature set control, these are for water heaters. Modern Eberspacher air heater controllers should control the temperature of Airtronic D2 D4 D5, D1LCC, D1LC and similar air heaters. They are not suitable for older models like D1L, D3L, D5L heaters. Most modern versions will work on both 12 and 24 volts. Ventilation buttons on controllers will not work with some heaters. **See 801 section. Timers like the 701 and 7 day timer are suitable for both air and water heaters. A few controllers have diagnostic facilities which can be extremely helpful for identifying the cause of problems. D1LC D3LC and D5LC diagnostics are compatible and have an additional light flashing facility. It is usually fairly easy to upgrade a controller but sometimes extra wiring may be required for the extra facilities. This page may help you decide which controller is the best option for your use. This page is primarily for air heater controllers, water heaters are being added as we learn more. 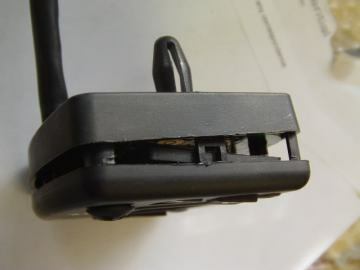 Warning:- If you have an Eberspacher and it has a truck manufacturers name on the label it may be non standard so these wiring details do not apply, see our Buying advice page for more details. There are a number of different Eberspacher controllers so which one would we personally choose for a modern air or water heater? Eberspacher 801 - general controller with ambient temperature display and diagnostics for finding faults. 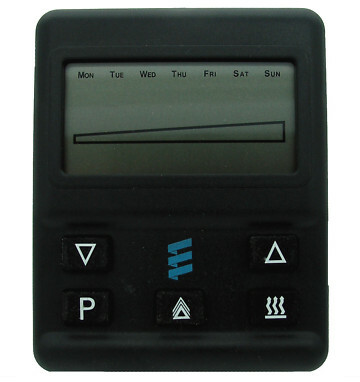 Eberspacher 701 (blue logo version) - controller with timer and diagnostics for finding faults. Eberspacher Mini controller - simple but as it has no diagnostics it is a poor third choice. EasyStart Select - Controller with diagnostics but only works with latest versions of heaters, see Page 2. It will not work with any of our heaters. Check before you buy! Our users experience with this controller is with only a single installation and that has unsolved issues. We need more feedback on this controller. Eberspacher' s complete lack of consistency in naming controllers causes much confusion. Eberspacher use 'Rheostat', 'Modulator' and 'Controller' to describe the same basic unit, ie a device with the on / off switch and a set desired temperature function. Making things more complicated there is also a separate type of controller inside or close to the heater that is the 'brains' of the unit, ECU Electronic Control Unit on early heaters, ICU Integrated Control Unit on later versions, we always refer to these as ECU on these webpages. A major difficulty buying second hand controllers is separating modern types from those with a thermostat which will only work with older models like the D1L etc. Eberspacher information on older controllers is not available so identifying those can be impossible. Some controllers are made by vehicle manufacturers. Most controllers not listed here will probably be thermostat types, not suited to D#LC, D#LCC, Airtronic. 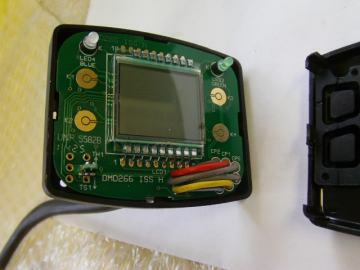 Further problems are caused by many users thinking modern controllers are like conventional central heating thermostats. Except for a few models Eberspacher air heater controllers do not measure the ambient temperature, they just send a signal to the Eberspacher basically saying 'The control is set at this temperature’. The heater measures the actual air temperature at its air inlet and adjusts the heat output to match the user controller setting. If the heater is close by this can work ok but if it is farther away or in a locker the temperature there can be greatly different. It fails completely when the heater circulates fresh air. 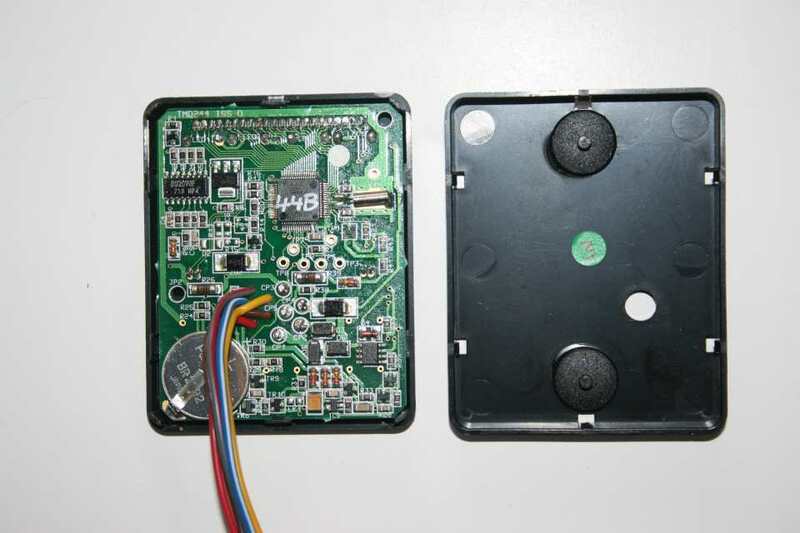 The sensor then thinks that the temperature of the outside air is the ambient temperature and of course that does not change as the heated area warms up. Even worse if the outside temperature drops below its lowest setting, usually between + 5 and + 10°C, the Eberspacher can automatically switch to maximum heat output, completely ignoring the temperature controller setting. The solution to both of these is to fit a remote temperature sensor. Details and advice are on our sensor page. Users sometimes encounter installations where the brown wire has been used to the controller instead of the brown/white and are unsure what to do. The confusion is due to there being two earth wires. Brown is a general earth point and is used for the earth connection to higher current items like fuel pumps. The brown/white is also an earth point but is taken from a point in the ECU that is a technical earth which is not so affected by electrical interference. 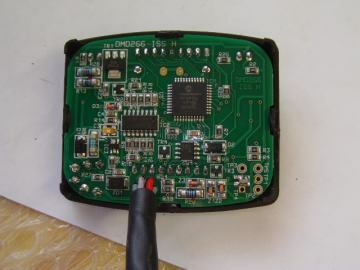 If controllers and temperature sensors are connected to the brown wire they will probably work but occasionally there can be weird unpredictable problems as described in faults page Weird faults section. You should connect them to the brown/white. Some controllers use both wires, the brown wire is just used for the indicator light which is ok. The grey/red wire can be confused with the grey wire depending on the viewing angle. Making this mistake can damage the ECU. Often users would like to add a second controller for operating their Eberspacher heater but do not know how. Typical use is a controller in the main area with an additional controller near the bed. We have instructions for any combination of 801, 701, Mini and Rheostat controllers on page 4. A standard numbering system and wire colours for controllers would have made upgrading far easier than the present arrangement. For each controller I am in the process of adding the same identifier codes a1 to a8 that are listed in the heater looms on the wiring page to make it easier to interconnect heaters and controllers. Each modern air heater (D#LC, D#LCC, Airtronic) generally uses 4 wires for the main controller functions. Water heaters have a preset temperature setting so do not use the grey/red wire. Three additional wires may be used. Press Heat button to switch on. Red LED illuminated. Adjust temperature with rotary knob. Press Off button to turn off. Press Fan button for ventilation mode. Blue LED illuminated. (This mode will not work on D#LC or D#LCC models). Press Off button to turn off. There are five wires from the mini controller and five wires from the heater loom. No one could possibly make joining them difficult could they? Eberspacher have! This colour arrangement is very counter intuitive so let me explain it differently. Join the red controller wire to the thin red loom wire and join the yellow controller wire to the yellow loom wire. Join the grey controller wire to the grey / red loom wire, not the obvious grey wire! Join both the brown and the yellow / violet controller wires to the brown / white loom wire, not the obvious brown wire! External temperature sensor - needed for some installations. (blue Eberspacher logo). Typical Ebay price £120 April 2015. Airtronic heaters, small white connector. 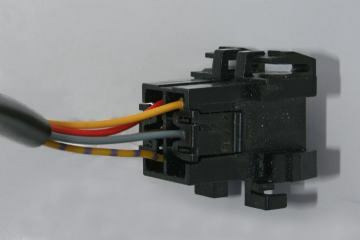 Airtronic heaters, larger black Molex connector. D1LCC, D3LCC, D5LC, D8LC connector. Ventilation mode may not work with Airtronic heaters. D1LCC, D3LCC, D5LC, D8LC different connector. Ventilation mode may not work with Airtronic heaters. Limited to 1 hour maximum operation, see below for continuous operation bypass. Model 701 00 006 with no diagnostics was fitted to BT vans and is quite often offered second hand on Ebay. Water heaters only, no temperature ramp. Except where stated main differences between models are the connector and ventilation modes. 12 / 24v operation with battery backup. Battery is soldered to board and has 10 to 15 year life expectancy. Press the heater button to switch on manually, the duration defaults to 1 hour, press again to increase duration by 10 mins, 30 mins, 60 mins, 90 mins, 2 hours up to 8 hours, then continuous operation. The 701 10 006 model is limited to 1 hour maximum. 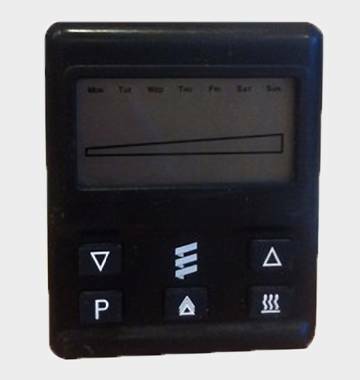 Use the ^ and v buttons to set the temperature on the ramp, there is no digital temperature display. The ramp has 20 steps so roughly 1 °C change per step. The 701 10 007 model is specifically for water heaters, it has no temperature ramp. Any other model can also be used for water heaters, the temperature ramp will be ignored. Ventilation (fan only) setting 1 hour only: We are unsure which heaters are compatible for some models. Press the v button repeatedly to get minimum setting then hold it pressed until fan displayed. Cancel by pressing the ^ button repeatedly to get back to normal temperature setting. Timer operation: Three memories store day of the week and time settings. Durations are the same as manual operation, no continuous setting. Times cannot be altered once timer has switched heater on. With the heater switched on press and hold the heater button until "dAtA" displayed. Release key to display AF-- alternating with the current fault code. An updated list of fault codes is on the fault codes page. Step through the last 5 fault codes by pressing ^ or v buttons. We recommend you make a permanent record of these codes before wiping them as the information can be valuable for diagnosis. Some faults including codes 15, 17, 50 lock the heater both for your safety and to protect the ECU. Always identify and remove the fault cause before unlocking. Press Heater button to exit. 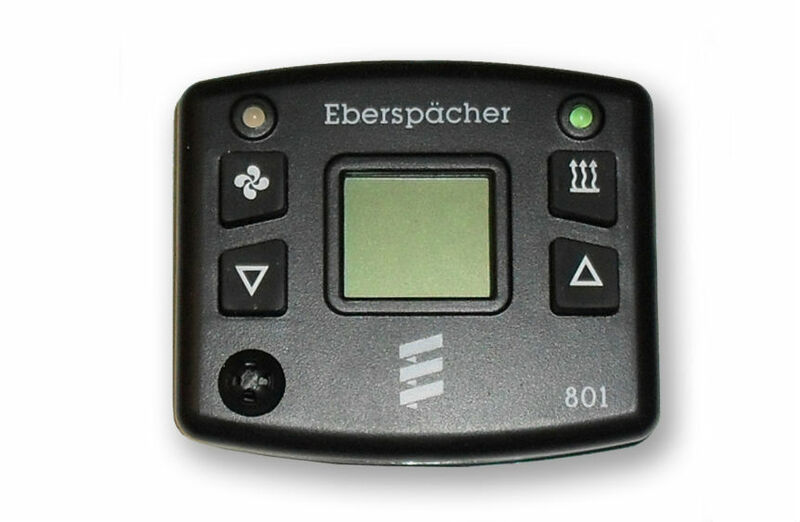 There are 6 models of the Eberspacher 701, each with or without diagnostic facilities. The Rheostat controller was often fitted to Eberspacher D1LC, D1LCC , D3LC and D3LCC heaters. It can also control Eberspacher Airtronic heaters D2, D4 and D5 but ventilation mode switching will not work. One major disadvantage is the temperature has to be set each time it is switched on. The circuit is very simple so is the easiest controller to understand how Eberspacher heating control works. A switch connects red and yellow wires together which turns the heater on. The 430 ohm variable resistor with the 1750 ohm fixed resistor set the target temperature. Eberspacher specification for the controller is it should adjust from 1750 to 2180 ohms. The dotted link between the switch and the control indicates that they are mechanically linked to the same knob. 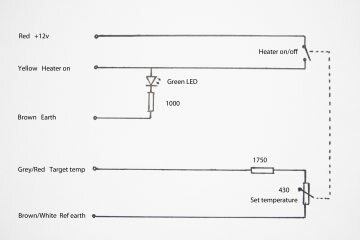 The LED and 1000 ohm resistor just give the green light indication. 701 with rear case removed. Fixing pegs pass through the case. To remove a 701 it has to be pulled straight off the panel. Levering at an angle will break the pegs as on right. New pegs are available from Eberspacher. Circuit of the Eberspacher Rheostat.